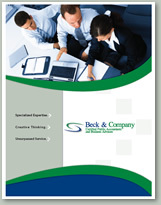 Founded in 1987, Beck & Company is an independent certified public accounting firm serving the Greater Washington D. C. metropolitan area with clients also along the Eastern Seaboard. Our firm has been built upon a tradition of service, technical expertise, and creative thinking. Our services are highly personalized, cost effective, accurate, and dependable. Above all, we find the most practical solution to foster success and opportunity in your business and personal financial ventures. Serving small and mid-sized organizations and individuals, we provide audit, tax, accounting, and consulting service that address all aspects of your business with one goal in mind – exceeding your expectations.